I wrote about Frank, a 23-year-old-or-so, who we had hired temporarily to do some yard work. Frank was a decent guy and relatively intelligent. He seemed really good compared to the other guy that we hired at the same time. The second guy was a serious shovel leaner who did virtually nothing unless El Jefe was around watching him. We ended up keeping Frank on for awhile as we always have projects. He was pleasant, polite, and very dependable. We taught him how to do the garden upkeep and other things. He helped us with some painting and building some shelves for the garage, as well as the yard work. He helped with blogging, too, as he was always bringing me snakes and bugs to photograph. One Saturday when I was talking to Frank about what we would do on Monday, we got into the conversation about him going to the US. He left and was gone for a few weeks and then came back around again to see if we had more work. We hired him back though he was clear that he would be trying to go to the US again in the future. Frank became less and less dedicated and even disappeared for long times during the day. 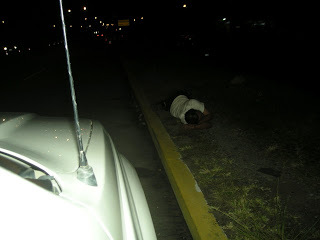 Once El Jefe caught him sleeping in our car, once in the former maid's room, and once I caught him sleeping in the shade on the sidewalk. What work he was doing was often taking five times longer than it should have. 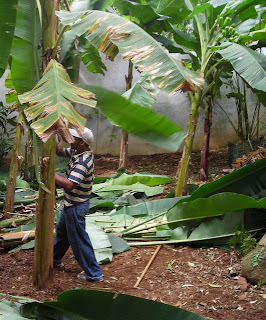 When it got to the point that the work he was actually accomplishing could be done in a day rather than a full week, El Jefe told him that we didn't need him anymore but that he could come on Fridays to mow the lawn and do the basic yard work. I didn't think we'd ever see him again, but he was able to get a full-time job minus Fridays with the contractor across the street. That worked for awhile, then he started missing days with all sorts of weak excuses. He also "needed" to leave a couple of hours early most days. When he hadn't come back for a month one time, we were surprised to see him at the gate one day, asking for his job back. It seems that he was in the wrong place at the wrong time and was shot in the shoulder by some gang members in the colonia where he lives with his parents. Being the nice and stupid people that we are, we hired him back again. Not long afterward, El Jefe saw him one day in town walking down the street talking on a L.7,000 (US $370) cellphone. A week or so later, El Jefe was working on something and discovered that a very expensive saw was missing. He was convinced that Frank stole it and there really is no other explanation. Our garage is always locked except when Frank was here. If someone was able to get into the garage, they certainly would have taken other tools as well. Only one tool at a time would fit in the backpack that Frank carried with him, however. We didn't want to believe that Frank would steal from us (as usual!). El Jefe kept him on for another couple of weeks, but kept the garage locked only pulling out the lawnmower and whatever tools Frank would need that day. Frank swore that he didn't steal the tool. After a couple of weeks he quit showing up. So that's the end of the Frank story. We haven't tried to find anyone else since then, just as I haven't tried to find another maid. It's just so hard to figure out. We are in the position where we could help a couple of people at least to have an honest job. It would be nice to have some help, too. Sure, those aren't prime jobs and there is nowhere to move up the ladder. 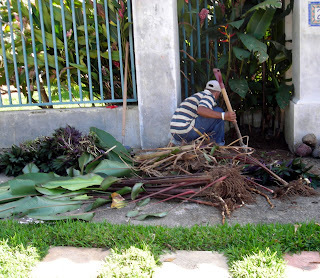 There are no Supervisor of Grounds Maintenance or Manager of Household Staff positions at La Gringa's house that someone could strive for. But, if you are in a situation where your family doesn't have enough to eat or you can't take your children to a doctor, isn't an honest job with an above-average salary working for decent people something to hang on to? If someone has no education, no experience, no talents, and no drive what else is it that they think they can find? My only guess is that it is a handout. And baring the handout, it is stealing whatever it is in their twisted minds that they think they are entitled to. Based on this experience and many others, I have finally learned one thing. That is that when an employee starts slacking off or missing work, there is no chance that they are going to realize the error of their ways. There is no reasoning with them and the thought "I better straighten up or I'll lose this job" is NEVER in a million years going to cross their minds. Joyce in Panama wrote an honest evaluation of her experience there − there are so many similarities. This behavior is a signal that they no longer want to work, that they are satisfied with their life of poverty, at least satisfied enough with it not to make any effort to change it. It is a signal that they'll either be quitting soon and/or be checking around for 'severance pay' that they can take with them on their last day − which, of course, you won't know is their last day until they never show up again. Most of us would like to believe that all people need is a hand up, a helping hand, a chance to learn and improve their lot in life. I won't give up thinking that, but I'm realistic enough now to know that it is NOT true for many. No more second chances from me! Update: I drafted this a while back and we do have a young guy doing some major clean up in the garden right now. He's very nice and doing a great job, but the garage door is staying locked at all times. I'm right in the middle of a 1,200 page novel right now, but this stack of books and magazines is waiting for me like a security blanket. I always get nervous when my reading supply gets low. 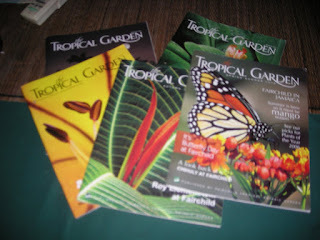 Then yesterday, I received these great tropical gardening magazines from D. It's like Christmas in La Ceiba. I guess I need to get on the stick here and start earning my pay. 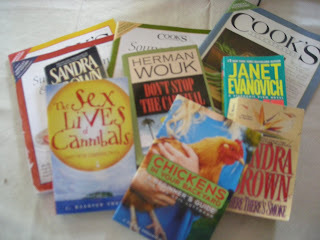 I've been kind of busy lately and can't seem to tie up the loose ends on some of these articles. Finding and uploading photos and arranging them takes time! It takes more time than the writing at times. Coming up is a new restaurant review, a couple of updates to others, my crystallized ginger fiasco, the end of the Frank story that Kman has been waiting for, my bewildered look at the La Ceiba housing market, several guest blogs, and much, much more. Stay tuned. "I don't understand why people want to leave. This country is wonderful!" Just a little blah, blah, blah to tide you over until I can get some photos uploaded and arranged on some articles that I've written and some guest blogs. I've been in Honduras for almost seven years now. Maybe I'm a little slow, but with the Honduran election cycle starting again, I just had one of those light bulb moments. I've known for a long time that the political party hold on people is very strong. You aren't going to get anywhere by claiming to be an independent. You state your party loud and strong for everyone to hear if you want to reap any of the benefits. You had better hope that they win. There are no Civil Service protections for government employees like in the US. There may be laws on the books, as there are laws prohibiting nepotism, but they are completely ignored in Honduras. Winning an election or being appointed Minister of Anything is the same as being crowned king. You own that agency, city or state. It's your kingdom, its employees are your serfs, and its finances are yours to do as you see fit. You can deposit big chunks of the budget right into your own bank account. Nobody will stop you. The President is the King of Kings and he is the only one you answer to. Those people who voted for you? Heh. Who needs them anymore? 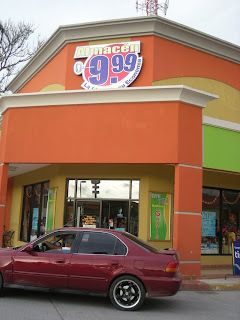 That is 'Democracía' in Honduras. What is really sad is that the Honduran people believe that they have democracy. They think that is how it is supposed to work. Winning office means getting rich. It's expected and, to a large part, accepted. How rich probably depends somewhat on how much international aid money is going to be available. Sure, in the US, after the elections, the top guys in each agency are out and the new presidential supporters are in. The jobs of the secretary who knows where everything is filed and the clerk who knows how to record a deed are safe. 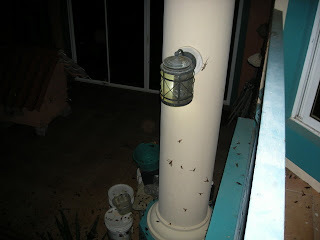 Here in Honduras, everybody is out! Who is around to train the new guys? I mean everybody is out down to the guards and janitors, if the new king or his knights have any friends who want those jobs. Every government job is doled out to the "politically deserving" and the brothers-in-laws and nieces. Off to Tegucigalpa we go to mamar la teta gorda! Okay, that part I knew. El Jefe told me long ago. I'm just telling you in case you didn't know. I read a study once from the UN or some other international organization which said that this complete upheaval in the government has such a severely detrimental effect on the economy that it takes an entire year to recover, that is, to just return to the same sorry state it was in the prior year. Everyone knows that if you need a permit, want to apply for residency, or even get an ID card or register a car, you had better get it done before the new government takes office or be prepared to wait a long time. 2006 - New President, all new government, complete chaos, decline in economy. 2007 - Government begins to be operational again and the economy recuperates to 2005 level. 2008 - Government is operational, employees know their jobs, things run as smoothly as a Central American government can run, UNTIL mid-year when the ministers and other top guys resign to start their campaigns. New guys come in. They know nothing, fire employees and replace them with their friends, change procedures, once again employees and institutions are in learning mode. 2009 - Election year; campaigning requires lots of people and who more likely than government employees who had better make their stand if they want a job next year? The opposition party will object to new laws, even if they like them, just so their party can get credit for them next year. End of year means sabotaging records and computers for the next administration, throwing out work in progress, and stealing anything that's left of the budget plus a lot of the furniture and equipment. 2010 - New President, all new government, complete chaos, decline in economy. Seems like the government is operating at its best maybe a year and a half or two years out of four. Throughout the entire four years, mayors, congressmen, ministers have to steal as much as they can since chances are they will do a lousy job and never be elected again. Is it any wonder that nothing gets done and that Honduras remains a third world country? Please don't say that it's the same in the US! Can you get a drivers' license, license plate, business permit, or birth certificate in any year regardless of the political cycle? I think you can. We can't. How often are you told that you can't get a _________ (name that document) because there is no ink, there is no paper, or there are no forms, or come back in a month after the clerk has been trained? People are told that daily in Honduras. It's NOT THE SAME! Update, 8/10/08: I just read in La Prensa the other day that the economy is declining right now because foreign investors are staying away because of the uncertainty of the upcoming elections (1 1/2 years away) and the leftist leanings of the current government. The following is a guest blog from Laurie, who is a teacher working with a Christian non-profit in Tegucigalpa, Honduras, whose focus is to see people lifted up through the message of Jesus Christ. They also seek to help with housing, education, and employment. Her blog can be found at Laurie's Blog Spot. What is it about dancing that lifts the human spirit? Our limbs are moving, but it’s our spirit within us that sings and shouts inside of us as we twist our bodies in differing positions. I think it is almost natural to dance if one is Honduran. And Christmas is the perfect season to experience the joy of dancing in Honduras. I watched street performers performing traditional dances near the Cathedral in Comayagua during the Advent season this past year. The joy and excitement of the young performers as they moved their lithe bodies to the rhythm of the music spread to the watching crowd. We laughed and clapped as they re-enacted a drama about two lovers through dance and pantomime. As night overtook the street, the people dispersed. But I sensed as we walked down the cobblestone streets, that we were a bit lighter in heart that night. The dancing had captured our hearts, even for perhaps, just one moment. On Christmas Eve, I visited several Honduran homes for dinner and festivities. Going house to house, I witnessed dancing at each house. The first home belonged to an evangelical pastor and his extended family. We ate, exchanged small gifts, and then, we danced. In a circle, with grandparents, sons, daughters, and even a baby in arms, we danced together in a circular pattern around the room to the simple carols on the radio And we laughed. At the second home, our arrival was welcomed by the removal of almost all of furniture out of the living room. It was time to dance, again! All of the ladies made a circle, and one lady at a time took to the middle to showcase her special skill. At this home, the dancing was more sensual, and I felt the pulse of the ancient tribal customs as hips swayed and bodies gyrated downward. My gringa imitation was applauded, even though I knew I didn’t possess the genes for this ancient ritualistic dancing. At my final stop, the dancing was more comical. It was, after all, well after midnight. The fireworks were spent, the tamales had been eaten, and now it was time to dance again. At this home, it was the men who entertained the family with different versions of exaggerated hand waving, spirals and twists. We laughed, ate again, and continued dancing. Around four in the morning, I found my bed and collapsed. Exhausted but happy. Dancing filled my dreams. If you don’t know where to start, may I suggest Rhythms del Mundo Cuba? Start with Dancing Shoes by Arctic Monkey, slow it down with Casablanca by Ibrahim Ferrer, and then, finish with Killing Me Softly by Omara Portuondo. All of these songs are available through iTunes. Have fun! Thank you, Laurie, for providing this guest blog. I so apologize for the posting delay and wish to let those of you who have been waiting to see your guest blog articles appear that I will be posting them more regularly. I'll email the link to you when they are posted. Thanks for your patience. 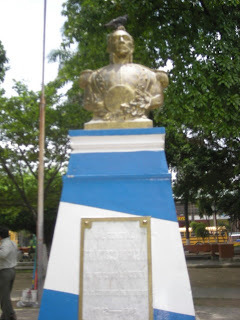 I'm going to tell you a legend that has been going around La Ceiba for many, many years, long before I came here. El Jefe believes that the legend is true and has a friend who knows Los Pumas, so I believe it, too. 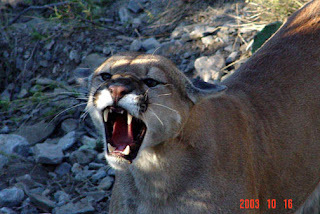 Los Pumas were four friends who were formerly Honduran police officers. Whether they left the police force because of the corruption, the pay, or the frustration with constantly seeing criminals go free, I do not know. The friends decided in a vigilante fashion ('vigilante' being used here in the English language sense, not the Spanish sense of a guard) that they were going to do something about crime, at least some crime, or at least some criminals. They called themselves Los Pumas. The former police officers became, well, sicarios (paid assassins, contract killers), but killers for the good, if there can be such a thing. I suppose there cannot be such a thing as 'good killers', but I'll have to admit that I do begin to get a different attitude when I see how the justice system works in Honduras. 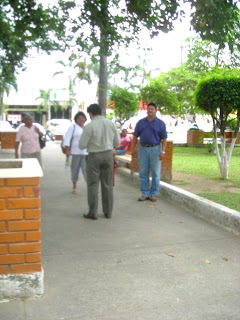 Many Ceibeños believe that they are good, kind men. Those who know them say that if you don't know what they do, you would never, ever guess. Allegedly, if someone has done some injustice to you and gotten away with it in the legal system, you can go to Los Pumas and pay them to get your justice for you. That is a little worrisome if the bad guy should get there first and tell a different story. Sorry, I don't know the current rates. A woman who El Jefe knows related this story: The woman runs a small pulpería (corner store) in her home. One day, her husband, an ex-police officer also, was on the roof making some repairs. Mareros (gang members) came in, pointed guns at the woman, and robbed her. The police investigated and captured the suspects (a rare occurrence) and the wife identified them as the robbers. The husband knew how poorly the justice system works and knew that before long they would commit more crimes. He also feared reprisal against his wife when (not if) the criminals were let free by the courts. He told the police that he would not file the denuncia (official complaint needed for prosecution). He said to let them go. At this point in the story, I was wide-eyed, mouth gaping open, saying, "WHY would he tell the police to let the criminals go?!" But the police understood. They released the mareros. A couple of weeks later, these same men were murdered and their bodies were disposed in the river. Their killers were never found. Los Pumas also do pro bono work. It is said by some that they sometimes work with the police by doing their own investigations and doling out their own justice. 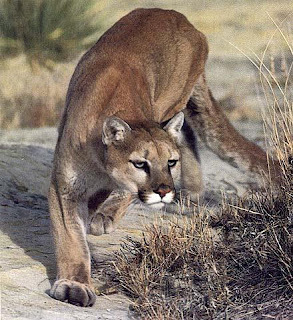 Los Pumas despise mareros. Las Mercedes, up at the top of a very high hill, is one of the most, dangerous, gang-ridden areas in La Ceiba. Taxis won't go there. Rarely will police go there unless they are going in full force. (I've been there.) The mareros don't allow the good people who live there to move away, as they realize that the decent people are the only reason that the police don't just come and blast the whole colonia away. How do they stop people from moving away? They tell them that they will kill their whole family if they do. La Suyapa is an adjoining colonia. Because the gang members often came to La Suyapa to rob and terrorize the inhabitants, people were afraid to walk at night or even leave their homes day or night. Los Pumas were consulted. One by one those mareros were eliminated until the rest of them learned to leave La Suyapa alone. Now people walk freely in their neighborhood as they used to do. 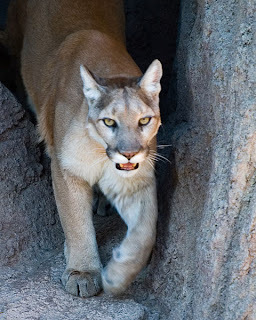 One of the Pumas was murdered. Now there are only three. The story goes that another group of men once claimed to be Los Pumas for a time. There is only one Los Pumas group. The imitators were eradicated. In another neighborhood (or possibly the same, I'm not sure), a Miskito man had been and was continuing to rob a lot of the houses. People complained to Los Pumas. Shortly after that, they were told that there would be no more robberies and that they would read in the newspaper about a body dumped into the river. They had no more robberies and a body was reported to by found in the river the following day. So, readers, what do you think? Real or fiction? however, there was nothing for 9.99 in the store! The government handed out checks of L.5,000 each to 826 La Ceiba taxistas as a subsidy for the high fuel prices. 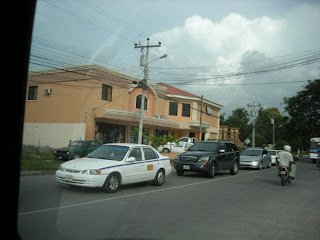 --I've always heard there were 1,000 taxis in La Ceiba. Maybe the other 174 are illegal. The Yo sí puedo! (Yes, I can!) program is being launched in La Ceiba to combat illiteracy. Adult students will be given 2-hour long night classes in their neighborhoods if they can get 20 students per class. --Excellent, but the classes are only three months long and the teachers are not paid. How much can they really learn? The following articles are from the weekly El Ceibeño section of La Prensa, July 19, 2008. This section is not provided online, hence no links. In La Ceiba, 45 police officers are being taught English in order to be able to communicate with international tourists. Volunteers from Finland, Canada, and the US are giving the classes. --That's a good thing. Rio Viejo, outside of La Ceiba: Eight manzanas of trees have been destroyed along the Cangrejal River in the government-protected Pico Bonito National Park (one manzana = 1.68 acres). The trees were cut for lumber or to clear and burn the land for agricultural purposes. The loss of thousands of trees endangers the environment and the source of water. --When is it going to end? When we have no water? Protected, shmotected. It means nothing. 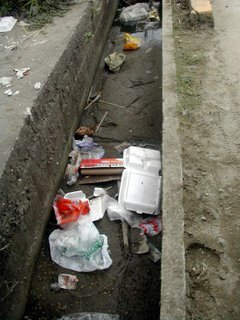 In a related article, José (Pepe) Herrerra, local environmentalist and USAID representative, said, "The truth is that the authorities in our city need to do much more." --Translation from PCness: they are doing nothing. 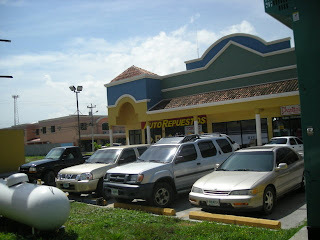 The online Paginas Amarillas (Yellow Pages) is opening a La Ceiba branch! --Thank goodness. I hope the local businesses will advertise. Do you know the most common sentences uttered by gringos throughout Central America and Mexico? "Do you know where I can find ....." Ditel.hn − It's a good thing. The hair looks a little like Suze Orman, don't ya think? 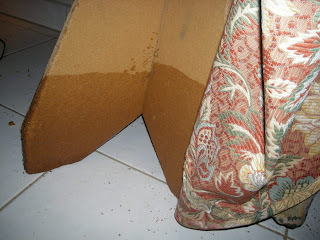 A reader wrote that she was having problems opening the Blogicito using Internet Explorer. In fact, she said that she hasn't been able to read it for a month! Yikes! That's bad. I want everyone to be able to read the Blogicito. Have any of you had any problems like that? If so, do you have any idea what could the cause of the problem. I want to fix it if I can. I've made a few minor changes in the past month, but I don't think those could be the problem (new weather widget and list of latest articles from my blogroll). I convinced her to download the free Firefox browser, which she did − not just to read the Blogicito, but because it's just a better browser and she had been wanting to do get anyway. Firefox flies like lightening on my computers compared to IE. I would never go back. I'd appreciate any insight any of you can give me. What do I see up ahead? Actually, this is not such an uncommon occurrence. 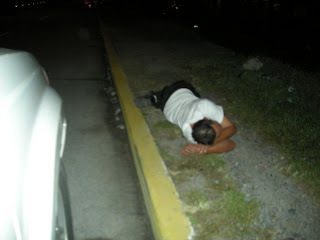 People, usually men, get drunk out of their minds and then just sleep it off wherever they fall. At least he isn't in the street. It's best not to stop to help because sometimes they are robbers faking it. Chances are good that this guy just drank up the week's grocery money. 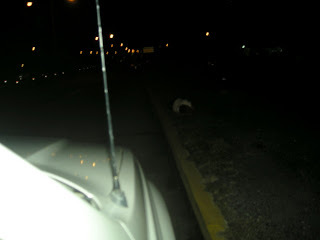 We did find a woman laying in the middle of the highway one night! We couldn't leave her there so we stopped, thinking that she had been hit by a car and left for dead (another common occurrence − some give no more thought to hitting a person than they would a dog or cat. Don't believe me if you want. It's true.). We stopped, blocking the highway, put the blinkers on and got out of the car. At first I thought she was dead, but then she started moaning. El Jefe tried to find out what happened, where she was hurt, etc. and he called the police to have them come and send an ambulance. This also is a big risk, as we have been warned by neighbors to not stop to help people as the police may accuse YOU and detain YOU for injuring the person, even though you were the good Samaritan. Then I noticed that she was laying on her cardboard 'bed.' Not likely that would happen in an accident. Spectators came out of nowhere and we were informed that the lady was crazy. She must have been because she refused to get up and get out of the highway. She got belligerent when someone picked up her 2"x4" (piece of wood that she apparently used for protection). That scared me because I was afraid she would hit someone with it or smash our car window. El Jefe promised she would get it back, but she first had to get out of the highway. He and a friend finally picked her up and carried her off the road. He talked to her for awhile to try to get her to understand that she couldn't sleep in the highway. There are a lot of mentally disturbed people like that in Honduras. There is no real help or assistance for them in most areas and they probably wouldn't take it if there was. 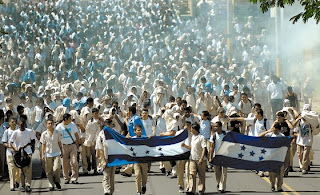 The following are some of the more interesting Honduran news items for the week ending July 20, 2008. Links to the complete articles (in Spanish) are given. National: After a week and a half teacher strike leaving a million and a half students without classes, President Zelaya signed an agreement guaranteeing to put an end to the conflict (3,000 teachers going without their pay) and the teachers agreed to go back to work. --Promises, promises. Been there, done that. 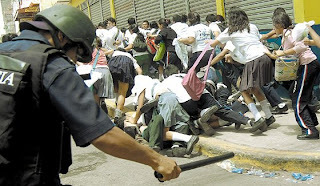 Tegucigalpa: No sooner had the teacher strike been resolved when the students went on strike demanding a doubling of the transportation bonus. 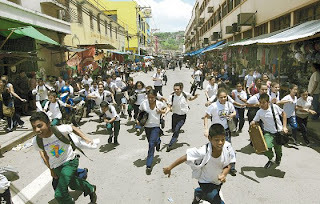 In Tegucigalpa, 3,000 students marched to the Presidential House, committing acts of vandalism and throwing rocks and bottles along the way. Another group of students held a demonstration in front of the Ministerio de Educación building, similarly throwing rocks. Later in the afternoon, students again "took" the Ministerio de Educación and the National Congress installations. Thousands of motorists were inconvenienced by the marches. The police were said to respond inadequately. Thirty students were detained. All this was following other demonstrations earlier in the week and a supposed agreement between the Minister of Education and the student organization. The government provides a L.400 (US $21) transportation bonus to 150,000 students. Students wanted it increased to L.800 (US 42). Some 400,000 students are ineligible for the bonus because they are failing or repeating grades. --Ever heard of student bus passes? They'll probably just buy cell phones with the money anyway. Politics: The big news last week was the official announcement of the political candidates for the 2009 elections. Every presidential hopeful has a female vice presidential candidate. Those candidates already mamando la teta gorda have to resign their government positions in order to campaign. President Mel may be running the government solo for the next year and a half. --Forget the hoopla. I predict the big battle will be Pepe Lobo (Nacionalista and 2005 losing presidential candidate) vs. Roberto Michelletti (Liberal and current president of the National Congress), though Mario Canahuati (Nacionalista and big businessman) is interesting to me. The next president will be a Nacionalista because so many citizens are very unhappy with the Liberal government of Mel Zelaya. 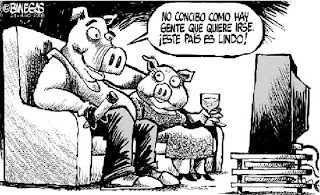 Dario Banegas, the cartoonist, is running for Diputado (Congressman) from the Department of Cortés. --Good luck to him! He'll have no end of material being right in there with the corruptos. If he's elected, it will be interesting to see whether the tone of his caricatures changes. Miami, US: Advisor to the Honduran President, Milton Jiménez Puerto, was offered a plea bargain in his resisting arrest and public intoxication charges. In exchange for attending an anger management class and a $50 fine, he'll get out of the potential one year in prison sentence. 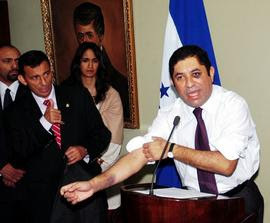 A few months ago Jiménez resigned from his former position as Chancellor of the Republic after causing a huge scandal when he was stopped for drunk driving in Honduras and later got in a brawl with several police officers at the station. It was captured for YouTube. --Jiménez: Do you know who I am? It was only wine. That doesn't count. Me: I told you so. The guy is an embarrassment to the country. Get rid of him. International: Venezuelan President Hugo Chávez has 'flexibleized' Honduras' payments to Petrocaribe. Honduras will now pay 40% of the cost of our fuel in 90 days with remaining 60% being paid over 25 years with 1% interest. --The interest rate is good, but isn't that kind of like taking out a 25-year mortgage on your lunches at Burger King? 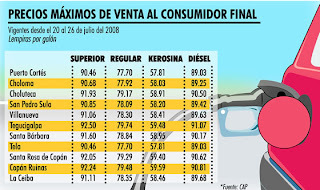 Gasoline prices increased another two lempiras (US 10 cents) this week. Prices for La Ceiba are now regular, 78.35 (US $4.15); superior, 91.11 (US $4.82); and diesel, 89.68 (US $4.75). The rates are set by the government for each city. --The government is still subsidizing the prices. Honduras has experienced a noticeable 2.2% drop in the birth rate according to the United Nations due to the increased use of contraceptives. --Sounds good but I don't trust the statistics. It's too hard for some to get a birth certificate to be sure. The Central American Bank (BCIE) donated US $60 million to aid Honduras with the food crisis. --I hope BCIE is going to keep control of the dough. More Strikes: Public hospital doctors threatened to strike. They demanded and received a 3.5% increase. Current base salaries of the 2,500 public doctors are L. 23,000 monthly with specialists receiving L.26,000 monthly (US $1,217 and $1,376, respectively). --Well, L.23,000 is only about 7 times minimum wage. Of course, I think most of these doctors are part time and have private practices, too. The National Congress is studying a proposal to increase salaries as follows: 8% for those making L.10,000 or less monthly (US $529), 6% for those making 10,001 to 20,000 (US $1,058), and 3% for those making over 20,000. The proposed increase would not affect employers with less than five employees or those employees in syndicates or collective contracts. The current minimum wage is L.114.28 per day (US $6.05), which only covers one half of the cost of food for an average family of five. --The increase is needed, but I'm not sure that the highly paid should have an increase. Inflation is expected to be 12% this year. 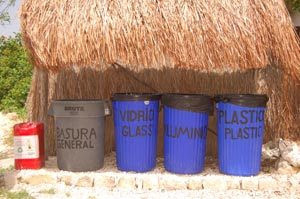 A lot of us lament the fact that there is no organized recycling in Honduras (at this time that I know of). But if you live in one of the medium to larger cities and towns, if you bag it, they will come. I was a big recycler in Dallas and was very involved in getting my neighborhood to do the same − pretty successfully if I do say so. 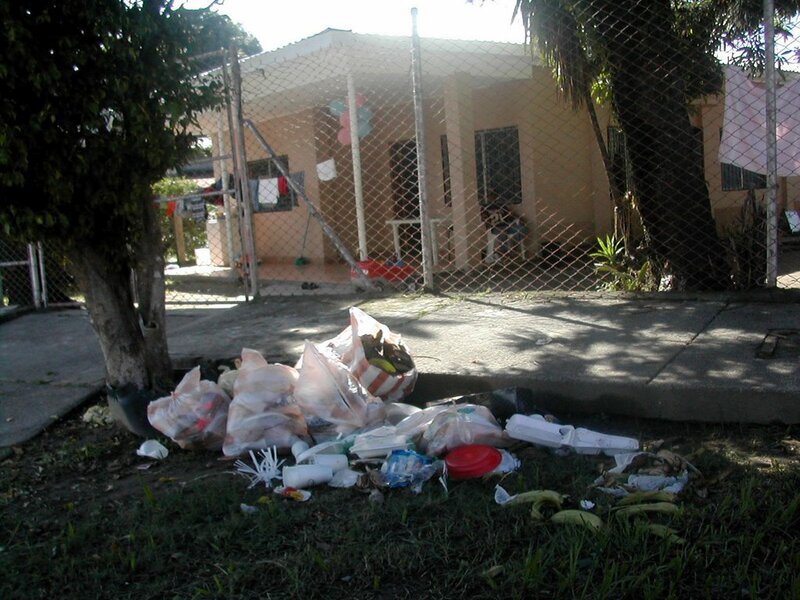 So when I came to Honduras and had to throw that first Coke can in the trash, I felt terrible. Over the months and years, I didn't get over feeling bad about throwing cans and plastics into the trash. I couldn't get used to it. 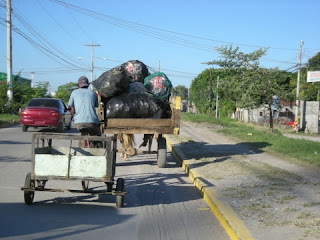 Finally, after we were living in our house, one day I noticed the trash men opening the trash bags and digging through them before they threw them into the truck. 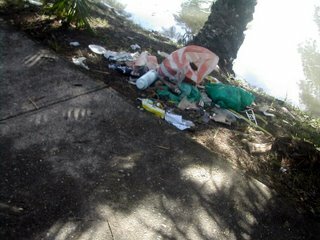 I had seen a man looking for food in the trash before when we lived in an apartment (and fed him) but these men weren't looking for food, they were looking for plastic! So, El Jefe talked to them and told them that we would save our plastics and cans in separate bags and put them out alongside the trash. They were very happy about that. 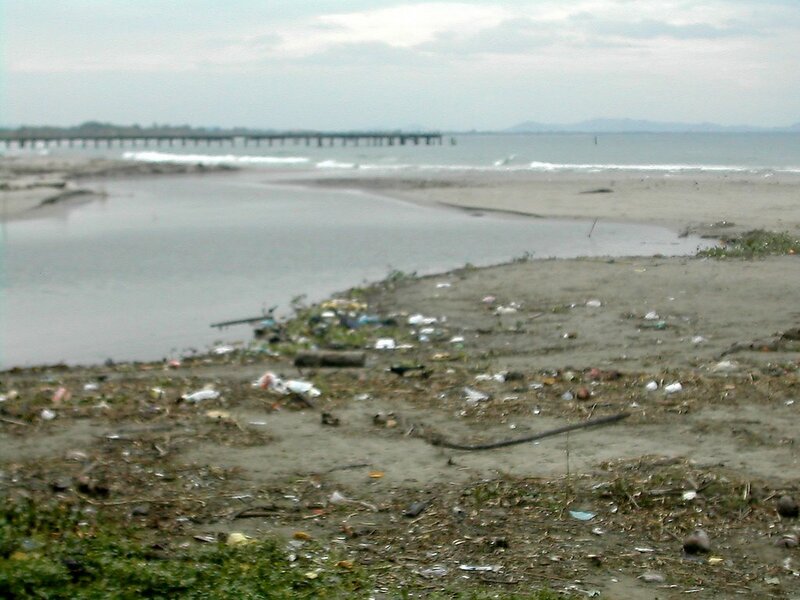 We can only imagine what a horrible job it is to search through our nasty trash. I rinse all the plastic and metal refuse and put it in a small bag hanging in the pantry. When it gets full we take it down to the garage and sort it into two larger bags, one for metal and one for plastic. When these are full, we put them out for the trash men. Rinsing and sorting may be more than you need to do, but it takes less than a minute a day out of my life and costs nothing. 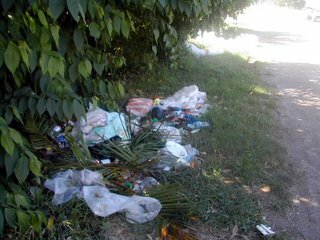 I'd like to encourage all of you expats in Central America, or anywhere where there isn't organized recycling to talk to your garbage collectors about whether they recycle. They can make a few extra pesos by selling these things and you can feel good about not contributing to the mess that we all complain so much about. If you don't have garbage collection or they aren't interested, ask around your town. There is bound to be someone who collects recyclables for sale. A once a month trip to drop it off when you are going to town anyway is not a big deal. In countries where there are so many extremely poor people, sometimes all you have to do is put the bag on the curb and someone will pick it up for the little money they can get for it. Once they find that source (you! ), trust me, they'll be back. 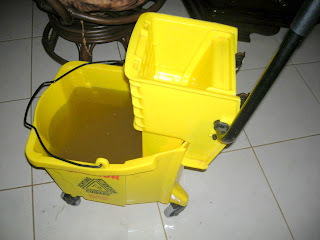 Maybe your or your neighbor's maid or gardener would like to take it to sell. We don't have any neighbors close by and people rarely are walking on the street, but whenever we want to get rid of old paint, scrap metal or wood, really anything, all we do is put it on the curb and it disappears like magic! One man's trash is another man's treasure. We don't have to be filling the landfills with things that people can use. 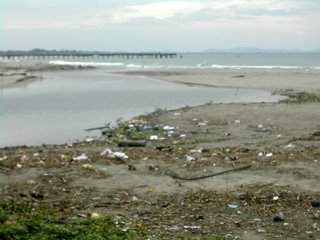 Who more than we gringos who so loudly lament the litter in Central America should take that extra step to do something about it? Talk to your neighbors, or better yet, their kids about what you are doing. It takes such little effort to collect the things. 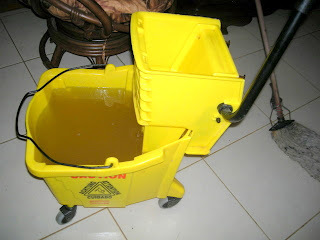 Rinsing is optional, but I recommend it to avoid attracting bugs to your kitchen or garage. Don't make excuses. Just do it! Those bad habits of littering and not recycyling can change. I was so encouraged by this article from Playa del Carmen, Mexico, How are we doing? Take a look at it. People can change! 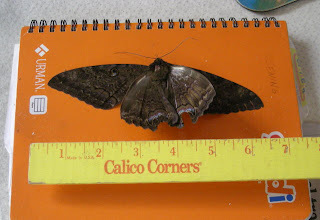 Moth found on the floor one morning. Oh, boy. This one tops anything yet to which I've ever admitted here on the Blogicito. Actually it was only two-thirds of one level of the house, not the whole house, which would be difficult to do since it is several levels. 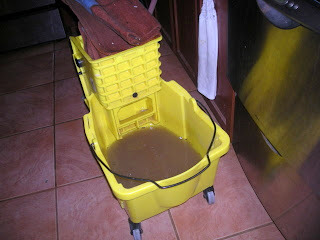 Whenever the water has been off for awhile, we have to clean all the crud and black water out of the lines. I've explained that before and I'm not in the mood to do it again. Read this if you don't remember. After all the usual crap came out, I noticed the water was still yellow from the sand/soil in the well. 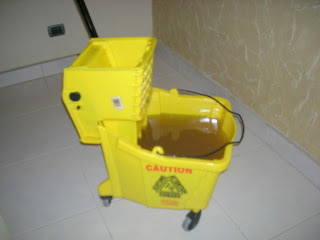 So I left the faucets running and I went upstairs to the....um....you know....the computer. 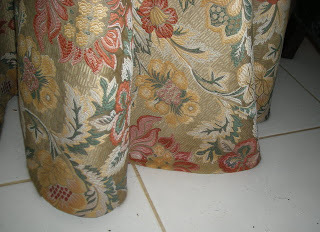 This was an old, cheap table meant to be covered with a tablecloth to hide its cheapness. 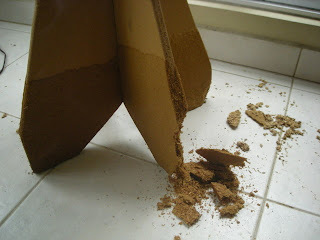 When people tell you not to get furniture made with particle board in the tropics, please believe them. and then finally this last couple of gallons. 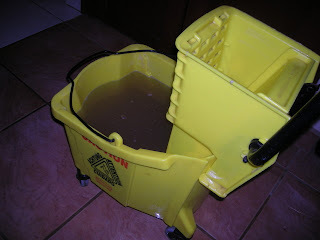 Two and one-half hours of mopping. Thirty-seven gallons of water. I left the fans running to help to dry everything out and went to bed. Okay. I know you want to know: How did this happen? 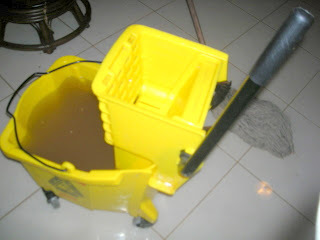 The strainer in the small sink ALWAYS falls down and locks itself for filling the sink. ALWAYS. No matter how carefully it is placed. I know this, yet I started the water running without removing it. Apparently it locked itself into fill mode the moment I left the kitchen. It's a small sink, so within a few minutes it had filled, the water ran over (and behind) the countertops and continued on its merry way. That is why it was stupid. I counted 11 large coconuts, 17 medium coconuts, and about 27 small to tiny coconuts on this palm! I had no idea that coconuts were so prolific. It shouldn't be long now. I'm drooling. There is just so much you can do with coconut! 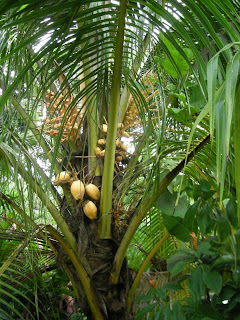 Even the yellow coconut palm has fruit. This tree isn't as healthy as the other. It has a black sooty mold on the palm fronds. 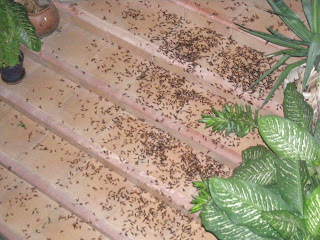 It was infested with fire ants which made it difficult and painful to get near it to spray, so I'm surprised that it is producing. If anyone knows of an organic way to get rid of this mold, I'd like to hear about it. 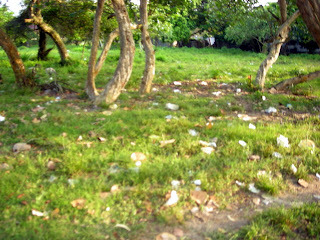 You can see the coconut status at April 2008 and October 2007 and the first two that were picked in April with more information about cocos (coconuts). 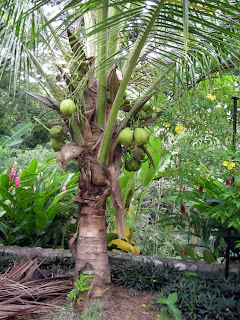 The October article includes a photo of both my coconut palms in May 2005 when they were about waist high. The growth has been amazing. Both palms are now as tall as our second story bedroom. The swaying palm fronds make for a nice view from our upstairs terraza. Everyday, ho-hum stuff for some, but downright exciting for me! I don't know what is happening here. I remember that I took a photo of something similar last year but I couldn't find it on my blog. El Jefe took these photos at night. 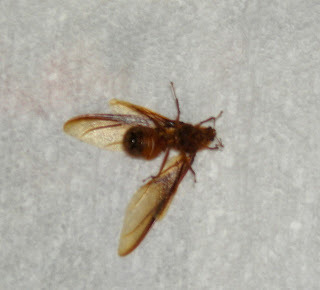 He said there was a huge black cloud of these wasps. He could hear the noise of the swarm. El Jefe, assistant blogger, also took a video but it was too dark to make it out. They had poor Chloe the Rottweiler backed into a corner of the terraza. She was scared so he had to let her inside the house. I wonder if chickens eat them. If so, they must have had quite a feast in the morning. They even get inside the house, too. Our window screen keep out only the most stupid of insects. 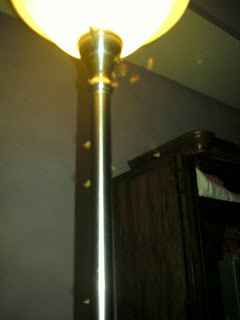 Thankfully, they were more interested in buzzing around the lamp and killing themselves than they were in stinging us. 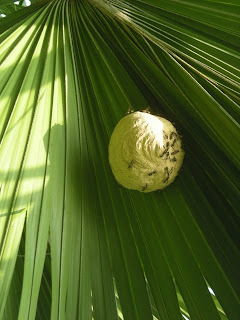 I think these wasps may be coming from this type of nest. We have those nests all over. We've been lax about knocking them down when they first start building the nest. Plus they often build them where we can't easily reach. 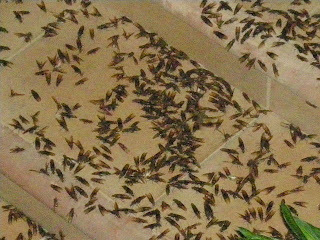 The mass suicide continued for a couple of nights. 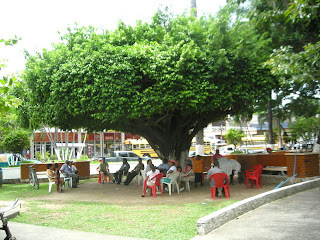 I have been remiss to not have shown you La Ceiba's Central Park before now. It was always on my mind but I just never got around to it. The poor park has seen better days. 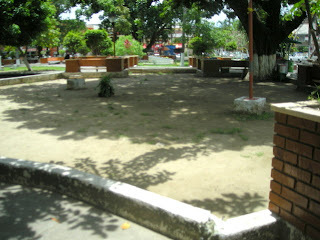 Hondurans like order and it shows in the design of this park. The park is surrounded by a short wall and the entry walkways are like spokes of a wheel leading to the center where there is the large monument shown at the top. The outer walls of the park contain palms and other trees, making it feel a little more secluded from the city. 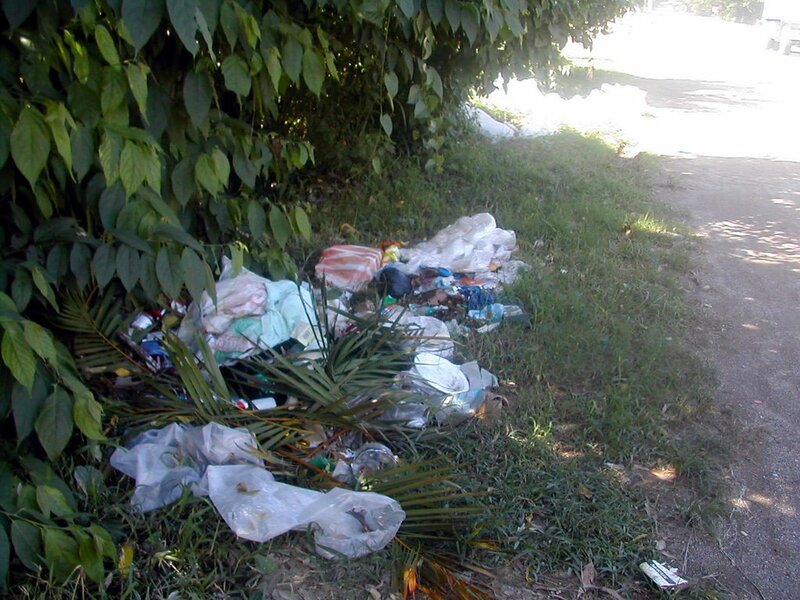 The La Ceiba park was clean (amazingly no litter! ), shady, and orderly. I noticed at least two trash cans in the park. Concrete sidewalks, walls, and high curbs assure that no one will stray off the paths to the areas which formerly held grass − remember, we must have order. The barren formerly grass areas had been recently raked − even dirt must be orderly. It has square concrete pools that appear to have held water and possibly fountains at one time but no more. 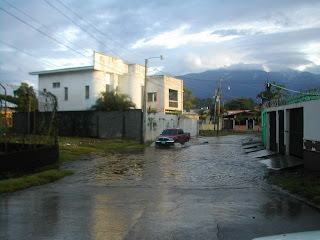 La Ceiba has had some water rationing in the past months. Perhaps at certain times of the year, they do fill the pools. 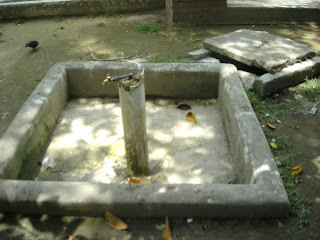 The large square concrete pool which formerly held a crocodile for many years is now empty and dry. I really felt sorry for that crocodile, all those years laying on a concrete pad with nothing to do, nowhere to go, and probably nothing to eat most of the time. May he rest in peace. 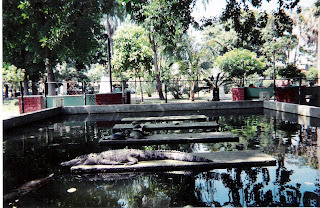 This is an old photo of the crocodile from 2000. 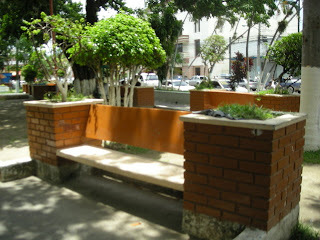 There are several concrete benches where people can sit in the shade. Tall concrete and brick planter boxes hold small trees. The plants are neatly trimmed. In most of the walled off areas, the soil looks powdery and completely lifeless. It has sunk a good foot below the level of the sidewalks. Most of these areas are completely barren but one or two sections still have grass. I suppose that is because these areas are filled with street vendors two or three times per year for holidays and the Carnival. Not even grass could survive that. The vendors not only spread out their goods on plastic tarps but they also live there in the park for the duration, sometimes up to three or four weeks. Everything has been neatly painted, probably 50 times or more, including the tree trunks and plant stems. I'm not sure why this is done. 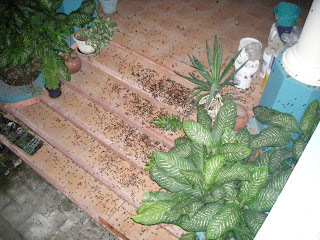 I think that a cal (or lime in English) whitewash is supposed to prevent certain insects from climbing the plant. I don't know if latex or oil-based paints have the same effect. Maybe it's just a (old-fashioned) fashion statement. 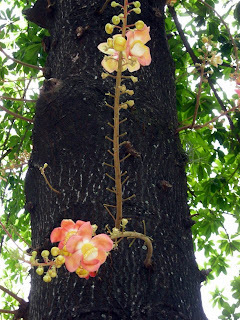 Look at the gorgeous flowers on this tree trunk! I have no idea what this tree is called but it had some sort of round, brown fruit up higher than I could photograph. There are several monuments. Of course, Francisco Morazan and Lempira are there. I was in a rush to get the photos before the others arrived and we had to leave. I don't recall all of the names. I was hoping the plaques would show up on the photos. I do remember that most of the monuments were dated in the early 1940's and 50's. Short concrete columns remain where they were used to block off access to the monuments in the past with chains. I guess that the chains have since been stolen. 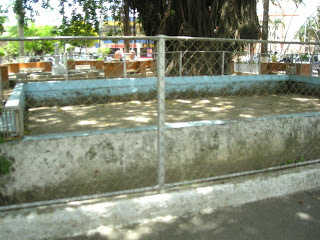 It is a nice sized park and people enjoy sitting in the shade of the old, old trees. The park is orderly, but too much concrete gives it an unfriendly feel to me. 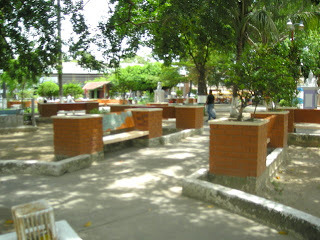 I read several months ago that there was some plan to remodel the La Ceiba park. I hope and pray that if they do, the first step will NOT be to cut down the old trees, but I fear that it will be. As a gardener, I know that soooo much more could be done with the park, and very inexpensively, too. More plants would soften the look of the concrete. Oooh, I'm itching to do that. The problem is that I would need about 20 truckloads of good soil and compost and I'm not sure I could sneak that in. What is going on with these eggs? What is the "Real Feel"?